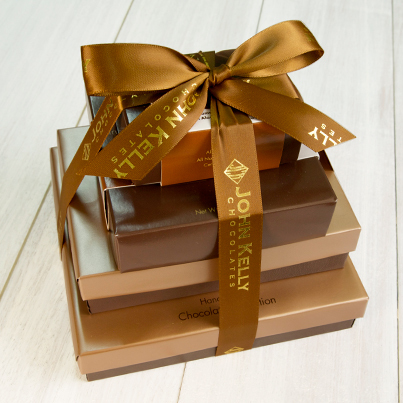 A gift box item that’s truly special for someone special. 12 pieces of the most incredible flavors of truffle fudge and clusters you can imagine. Just right for those times you need to make the right impression. This is a perfect marriage of our award-winning dark chocolate truffle fudge and the rich, slightly bitter taste of espresso. Coffee lovers will simply not believe the incredible mix of flavors that arise when these two classics are combined. 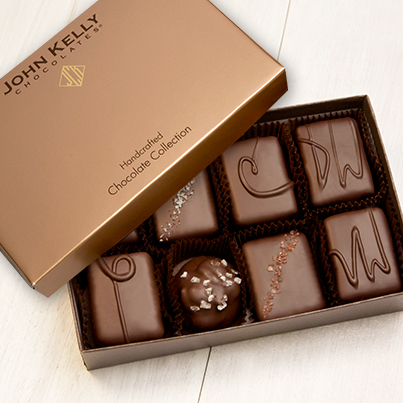 We call our original semi-sweet truffle fudge “classic,” although there's nothing traditional about it. Uniquely rich and velvety, it provides intense chocolate flavor. Enveloped in a firm, semi-sweet chocolate shell, it's also chock-full of crunchy walnuts. Uniquely rich and velvety, semi-sweet provides intense chocolate flavor. 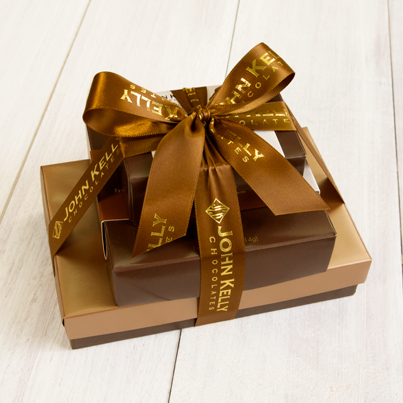 Our classic truffle fudge is enveloped in a firm, semi-sweet chocolate shell, which serves to enhance the luxurious, pure chocolate experience. We make peanut butter fudge with all-natural peanut butter – and white chocolate, for added creaminess – and layer it on top of our classic semi-sweet chocolate truffle fudge. We then cover it all in a chocolate coating, a perfect balance. Lovers of this classic combination won’t be disappointed. For the chocolate devotee who craves the bold, bittersweet taste that can only come from a darker, richer chocolate combined with walnuts. Our dark chocolate truffle fudge is enveloped in a semi-sweet chocolate coating, providing a full-bodied chocolate experience with a lingering silky-sweet finish. This is for the chocolate devotee who craves the bold, bittersweet taste that can only come from a darker, richer chocolate. 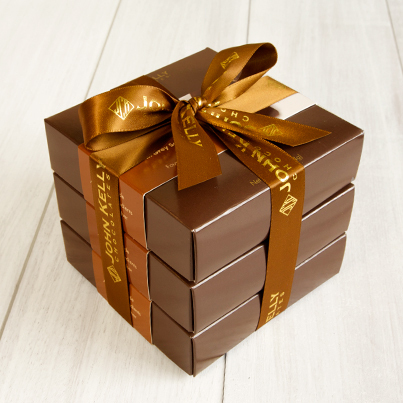 Our dark chocolate truffle fudge is enveloped in a semi-sweet chocolate coating, providing a full-bodied chocolate experience with a lingering silky-sweet finish. It’s no wonder that raspberry and chocolate are a favored pairing in gourmet desserts. A fantastic raspberry aroma and powerful burst of fresh berry flavor mingle with the more substantial flavor notes of our classic truffle fudge, creating a lovely fruity/sweet combination. A touch of the exotic is captured in this velvety, white chocolate fudge, enveloped in a semi-sweet chocolate shell and with a generous amount of walnuts. It is a luxurious blend of rich white chocolate that is not too sweet, and fragrant, all-natural vanilla extract. A sensuous chocolate experience. This is a rich and creamy layer of all-natural artisan caramel atop our signature semi-sweet truffle fudge, along with our semi-sweet chocolate coating. The bites are topped with a pinch of Hawaiian Alaea sea salt, which has an unexpected reddish hue and a crisp texture. This flavor starts as our award-winning dark chocolate truffle fudge, along with a rich chocolate coating. It is then topped with a pinch of French Sel Gris de Guérande sea salt, imported from Brittany. The bittersweet chocolate combined with the salt creates an unimaginably rich blend of flavors. We make all-natural peanut butter fudge, with the “secret ingredient” of white chocolate to maintain a sublime creaminess, and we coat each silky bar with high-quality Belgian chocolate. The entire piece is topped off with exotic pink salt from the foothills of the Himalayas, a beautiful presentation. A ball of buttery caramel with walnuts, enveloped in a delicious chocolate shell and topped with Mediterranean sea salt. What could be better? on our site. They'll be glad you did. > Looking For A Birthday Gift? Simply enter your email here and look for an email with a code to use on your first order. © 2019 John Kelly Foods, Inc.